A successful harvest is the culmination of the grape grower’s year, all the time and effort spent growing the finest grapes is brought to fruition when the crop is delivered safely to the winery. Harvest is a critical time of the season, it can be a time of great pressure and stress, as it is essential to harvest at exactly the right time to optimise fruit quality and flavour. 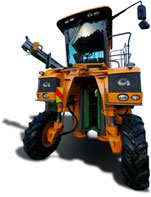 Mechanical harvesting utilises the most expensive equipment and requires the most skill, experience and organisational ability of any other vineyard operation. Vintage Harvesters Limited has a very experienced team of harvester operators in Marlborough, many of the core staff have worked over 20 vintages. Our team is backed up with qualified viticulturists and our own team of engineers. We are harvest professionals, we pride ourselves on our ability to organise and complete your harvest. One of the biggest fleets of harvesters in Marlborough..
Offering a full range of viticulture services..
© 2019 Copyright Vintage Harvesters Ltd. All rights reserved.